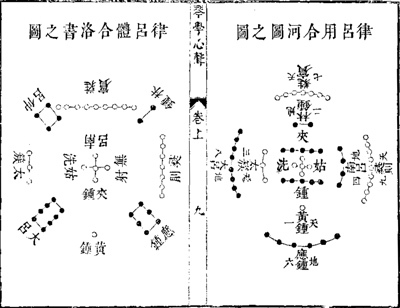 Qinxue Xinsheng, originally published in 1664, has the music of Zhuang Zhenfeng of Nanjing (金陵). The handbook has 2 folios in all, with 14 melodies, eight having lyrics. All but the Buddhist chant Shitan Zhang are said to have been Zhuang's own compositions, appearing here for the first time. The source of whatever other melodies he may have played and perhaps taught is not known. Each of these is interesting for quite a different reason, as will be discussed below. Based on commentary in the handbook from local literati, some of whom were themselves poets and painters of note, Zhuang was quite well-known and highly regarded in his day. 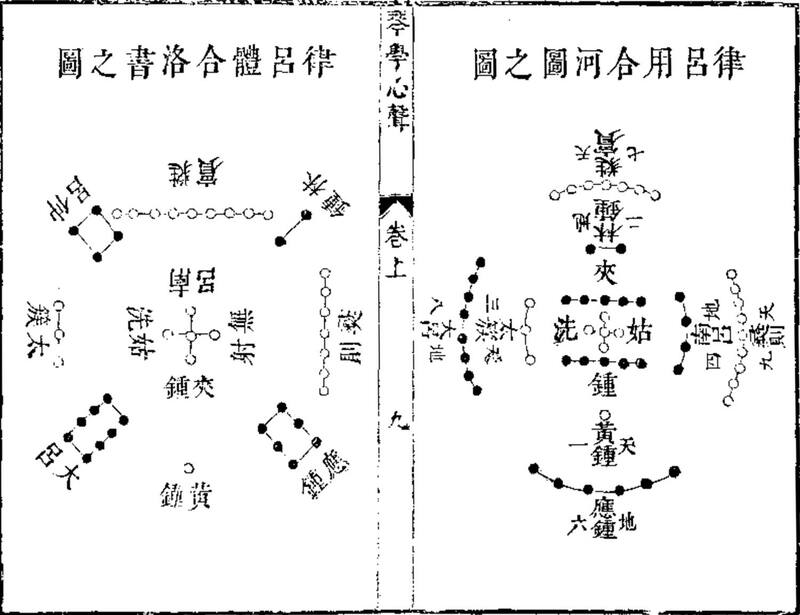 But in spite of this, only one of his handbook's 14 melodies became widely played later, this being the still-popular (or perhaps again-popular) Wuye Wu Qiufeng. Qinxue Xinsheng was apparently taken to Japan by Zhuang's student Jiang Xingchou, or at least around the same time that he went there, in 1676. There, as the monk known as Shin-Etsu, Jiang started the modern tradition of qin play in Japan. Although it is not clear which of its melodies he may have played or taught, there are clearly some connections. This is discussed to some extent in Van Gulik, Lore, p.231, but more work needs to be done on this. This variety should be useful for examining how qin songs were constructed. In at least one instrumental melody, Xiu Zhu Liu Feng, Zhang seems to be experimenting with melodies that deliberately use notes beyond the pentatonic, or even diatonic (7 tone), system. As for some of the apparently instrumental melodies that have lyrics, under the melody Yunzhong Sheng He (see below) Zhuang seems to make an argument that the lyrics do not need to be sung in order to enhance appreciation of the melody. A record in Zhuang Zhenfeng’s handbook can help us understand how Zhuang and his acquaintances built a collective understanding of gu. As mentioned, after Zhuang had composed twelve pieces of qin music, he sought out different influential figures to write prefaces and lyrics for his compositions. In the preface to his composition named "Sheng and Cranes in the Clouds" (Yunzhong sheng he 雲中笙鶴), Hu Dan 胡亶 (fl. 1649-1665) recounts the exchange between Zhuang and himself on whether a qin composition should have lyrics or not. When Zhuang presented his musical compositions to Hu and asked him to write lyrics for "Sheng and Cranes in the Clouds," Hu refused at first, stating that ancient qin music did not have lyrics. His examples were "High Mountain and Flowing Water" (gaoshan liushui 高山流水) and "On the King Wen" (Wenwang cao 文王操). Zhuang explained that since many current qin players did not know the ancient way of qin-learning, they needed lyrics to help them understand the ancient meaning of qin music until they could truly comprehend it. Finding Zhuang’s explanation persuasive, Hu Dan agreed to listen to Zhuang play his song, and eventually he wrote lyrics for it. We do not know whether ancient pieces of qin music had lyrics or not, but those were of little importance in the musiking between Zhuang and Hu. As long as they reached an understanding, their bond had been formed and even strengthened. As a language for communication in musiking, gu was not meant for seeing the "truth" per se; rather, it functioned to build consensus among the participants in a social network, and in that way, reinstated or reinforced the bond among them. Qin players and their audience could continue their bond only when they shared a similar understanding and admiration of gu. The question of whether qin melodies should or should not include lyrics is also mentioned here. What is said above suggests that Zhuang thought that lyrics could enhance a song even it they were not sung, or even intended to be sung. But further regarding lyrics, amidst Zhuang's variety of songs such as those mentioned above are rather romantic songs such are in the Li Yun Chun Si set. In Hangzhou there is only mention of his elegant meetings with gentlemen friends (especially by or on West Lake). But he also lived in Nanjing, and it would be interesting to know what if any connection Zhuang may have had in Nanjing with the Qinhuai entertainment area. Did he have women friends there who would sing his songs?